Anyone go racing last weekend? TC88a DIY Power adapter ? vibration problem solved - CHECK YOUR FRONT ENGINE MOUNT BOLT!! Help ID’ing... Heads and jugs are weird? What kind of saddle do you use on your sporty? Special thanks to a fellow XL Forum member "Knuckles" for loaning us a set of SE Street Performance Slip-ons for testing! First just to eliminate any confusion about what we tested, the above is straight out of the current (2019) SE catalog. The mufflers are marked individually as 80599-07 (front) and 80518-07 (rear), but the set is sold as 80503-07 as shown above. We tested the chrome versions. These are 50-state EPA compliant mufflers as you can see. Almost didn't need to wear my earmuffs. Strong down low, but dies at 5000rpm as you can see. Quite similar to the result we got from the Cone 2:1 pipe test. This is typical of a restrictive exhaust, you hit a wall where you just can't pump more air through the pipe. Comparison to the reference pipe. The Patriot is not the strongest pipe down low, and these slip-ons beat it up to 4400rpm or so. But the Patriot clobbered the SE slips-ons by about 21hp on top. That's not quite a record, because the Patriot clobbered the stock exhaust by 24hp and tied it down low. But it's still a lot. If someone could just invent a pipe that performs like the SE Slip-Ons below 4400rpm, and performs like the Patriot Defender above 4400rpm, they'd have a great pipe! Bottom line, put these on if you want a quiet, EPA legal exhaust, with good bottom end power. But they're not a good choice for top end power at all. I don't think so, I was running them on my 2012 48. Usually the catalyst is in the front pipe. Makes you wonder if they actually flow any better than the stock mufflers. It's pretty safe bet they improve performance over the stock mufflers. From the Hammer test they produced more horsepower than the Patriot pipe up to 4,400rpm. 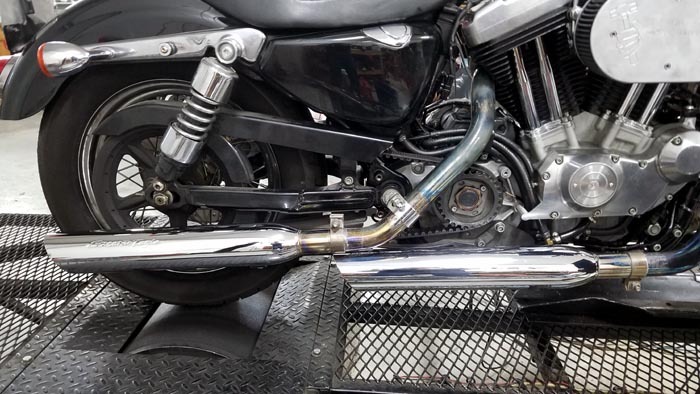 I run these mufflers on my Nightster and the improvement in low end is noticeable. They produce a proper Harley sound at a low enough volume to allow my wife and I to carry on a conversation from idle to highway speeds. Since I've only got one good ear left and I'd like to keep it, I've stuck with these pipes. I don't bother with the heat shields when I'm testing, so ignore the ugly head pipes. They're the stock 2007 pieces, as is the mounting bracket/crossover, which you can't really see, it's behind the mufflers. I also don't mess with the footpeg and brake pedal assembly and front sprocket cover, that stuff is just extra trouble when you're swapping pipes. I was just wondering about this configuration. I wonder what would happen if you took the baffles out and put it those torque inserts? They're CA compliant so I wouldn't think so. All times are GMT +1. The time now is 07:49.